Although Tulsi Sahib lived relatively recently, few details about his life can be stated with certainty. He may have been part of the royal family of Pune. One biographical account suggests he was engaged to be married against his will. On the day before the wedding, he ran away and took up the life of a sadhu, a spiritual mendicant wandering through forests, going from town to town, engaged in meditation. 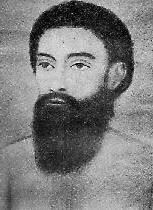 In the early 1800s, he settled in Hathras in Uttar Pradesh, where he spent the rest of his life. Tulsi Sahib practiced Surat Shabd Yoga, or the Yoga of Sound. He is particularly revered within the Sant Mat Sikh tradition. A search of the postings will give you several poems by Tulsi Sahib. Another Yahoo group with many postings of Tulsi Sahib's poetry and teachings. In depth information on the Radhasoami/SantMat tradition, including information on Tulsi Sahib.